Diabetes Mellitus (DM) is a metabolic disorder characterized by polyuria, polydipsia, weight loss, fatigue etc., sometimes associated with complications of retina, kidney, and nervous system. It is one of the lifestyle disorders whose prevalence is growing rapidly throughout the world. Conventional systems have developed medicines to control and treat diabetes but are unable to provide complete relief. In addition, they are associated with adverse effects. Ayurveda through its armamentarium can become a potential source of hypoglycemic drugs that may be relatively safe, significantly potent with negligible side effects and can improve quality of life (QoL). WHO has also identified importance of herbal remedies in the management of diabetes. Besides medicines, Ayurveda also prefers and prescribes Shodhana (purification/cleansing procedures), Pathya-Apathya (compatible diet and lifestyle), and Yoga in the management of diseases. Based on similarities in signs and symptoms, DM type-2 can be compared with Madhumeha in Ayurveda. Considering wide range of treatment modalities available for diabetes in Ayurveda; >200 research works have been carried out at the level of MD and PhD at various Ayurvedic institutions all over India, few of them are depicted at [Figure 1]. The present attempt is to compile all available research works done on diabetes in between 2000 and 2013, and provide brief information about them. Works carried out at Gujarat Ayurved University, Jamnagar at PG/PhD level under various departments during 2000-2013 were compiled and screened to assess the impact of Ayurvedic treatment modalities in diabetes management. The most common problem in diabetic patient is a general body weakness and a fast deterioration of major organs affecting all physiological systems including the mind. Ayurvedic management strategy include Snehana (oleation), Shodhana and Shamana treatments accompanied with suitable dietary and lifestyle modifications, which has been found very effective in controlling diabetes. Based on these clues, researches were undertaken in different institutes. As incidences of DM are high in Saurashtra region of Gujarat,  attempts were made to study the efficacy of Ayurvedic treatment modalities in DM at associated institutes of Gujarat Ayurved University. Among 28 research works; 14 works are related to animal experiments, remaining were clinical studies. Different therapeutic modalities used in these studies are depicted in [Figure 2]. References of drugs used in these studies are enlisted at [Table 1]. Total 1736 patients were included in these studies based on the signs and symptoms of diabetes along with random blood glucose ≥200 mg/dl or fasting blood glucose ≥126 mg/dl or 2 h blood glucose ≥200 mg/dl, during an oral glucose tolerance test. In maximum studies, patients with uncontrolled blood sugar levels with allopathic antidiabetic drugs. In such cases, Ayurvedic drugs were administered along with allopathic drugs. Only three studies were registered at CTRI. Vamana and Virechana are the two Shodhana procedures preferred in these works. Vamana is found to be more effective than Virechana, may be due to Kapha Pradhanatva of Madhumeha. But, owing to inconveniencies of Vamana Karma, patients prefer Virechana. Few studies were also conducted on Basti Karma. In Shamana therapy maximum drugs possess Laghu-Ruksha Guna, Katu-Tikta Rasa, Ushna Virya, Katu Vipaka, Kapha-Pitta Shamaka, Pramehaghna, Mutra Sangrahniya, Kleda Shoshaka, Medohara etc., properties, which effectively counteract the etio-pathogenesis of Madhumeha. Quality of life of diabetics is an important area of concern. Improved QoL was reported after Ayurvedic management in most of the studies. This may be due to rejuvenating and antioxidant properties of Ayurvedic medicines, improvement of body physiology and metabolism by body purification procedures (Shodhana), holistic approach and emphasis on suitable diet and lifestyle measures for diabetes. ,,, All Ayurvedic trial drugs were found effective in diabetes, except Kuberaksha, where negative results were found as it failed to attenuate the glycemic level and diabetic symptoms. Antidiabetic efficacy of Bhasma and metallic preparations is well described in ancient Ayurvedic texts  and validated recently. ,,,,, Zinc is very important in the synthesis, storage, secretion of insulin as well as in maintaining conformational integrity of insulin in the hexameric form, and thereby improves impaired metabolism. , Contrary to widespread fear of toxicity; all these Bhasmas are reported to be safe. ,,, Unchanged serological and hematological reports of the patients also supports safety of these metallic formulations. No adverse effects of Ayurvedic treatment were reported in any of these studies. Hence all studies validate the potential of Ayurvedic treatment principles in the treatment of diabetes. Though limitations were observed in these researches, the results can be considered as lead for further well stratified studies covering larger population. In nutshell, all Ayurvedic therapies were found to be significantly effective and clinically safe as no adverse events of adverse drug reactions were reported during treatment period. It was concluded that Shodhana Karma followed by Shamana along with Pathya Ahara and vihara was found as a suitable treatment plan to manage diabetes. In Shodhana therapy, maximum times Virechana procedure was carried out, while Vamana was found comparatively better than other Shodhana procedures. In Shamana Chikitsa, some Medhya Aushadha (brain tonics) should be prescribed along with other drugs, as while treating disease pathology, it is equally important to alleviate the disease triggering factors such as emotional stress. Along with drug interventions, emphasis must be given to promote a healthier diet and lifestyle plans among affected individuals. When used along with conventional drugs; no interactions were reported in any study. Moreover increased QoL was reported and in cases the dose of conventional drugs was reduced on tapering basis. Considering these leads; it is suggested that multi-centric trials involving scientists from different fields is the need of the hour that can evaluate probable mode of action of these drugs to give a scientific flavor to the age old science. Authors duly acknowledge all the researchers and involved technical authorities, whose works have been screened in the current attempt. Authors are also thankful to Dr. MS Baghel, Director, IPGT and RA, for permitting to compile and publish the work in the form of review article. Kerner W, Brückel J. Definition, classification and diagnosis of diabetes mellitus. Exp Clin Endocrinol Diabetes 2014;122:384-6.
International Diabetes Federation. Diabetes Atlas. 3 rd ed. Brussels, Belgium: International Diabetes Federation; 2006. p. 68. Dey L, Attele AS, Yuan CS. Alternative therapies for type 2 diabetes. Altern Med Rev 2002;7:45-58. Modak M, Dixit P, Londhe J, Ghaskadbi S, Devasagayam TP. Indian herbs and herbal drugs used for the treatment of diabetes. J Clin Biochem Nutr 2007;40:163-73. Mandlik RV, Desai SK, Naik SR, Sharma G, Kohli RK. Antidiabetic activity of a polyherbal formulation (DRF/AY/5001). Indian J Exp Biol 2008;46:599-606. Bishnupriya M. Concept of Mano Abhighatakar Bhavas on Ama (Free Radicles) Utpatti Particular to Madhumeha (DM). PG Dissertation, Department of Basic Principles, IPGT and RA, Gujarat Ayurved University, Jamnagar; 2001. Shukla N. A Clinical Study on the Role of Manas Bhavas in Etiopathogenesis of Madhumeha. PG Dissertation, Department of Kayachikitsa, IPGT and RA, Gujarat Ayurved University, Jamnagar; 2005. Mohanty B. Concept of Mano-Abhighatkara Bhavas on Ama (free radical) Utpatti Particular to Madhumeha (Diabetes Mellitus). PG Dissertation, Department of Basic Principles, IPGT and RA, Gujarat Ayurved University, Jamnagar; 2001. Pawar AM. A Comparative Study on the Role of Basti Therapy and Pramehaghna Drugs in the Management of Madhumeha (Diabetes mellitus). PG Dissertation, Department of Kayachikitsa, IPGT and RA, Gujarat Ayurved University, Jamnagar; 2003. Ahuja H. A Clinical Study on the Efficacy of the Virechana and Medohara Rasayana in the Management of Madhumeha W.S.R to (Diabeties Mellitus). PG Dissertation, Department of Kayachikitsa, IPGT and RA, Gujarat Ayurved University, Jamnagar; 2004. Patel AJ. Management of Madhumeha (Diabetes mellitus) with Shodhana and Shamana Chikitsa. PG Dissertation, Department of Kayachikitsa, Government Akhandananda Ayurveda Collage, Ahmedabad; 2004. Tikoo A. Clinical Study on the Role of Virechana Karma in the Management Madhumeha W.S.R to Diabetes Mellitus. PG Dissertation, Department of Panchakarma, IPGT and RA, Gujarat Ayurved University, Jamnagar; 2005. Kumari J. A Comparative Clinical Study of Nyagrodhadi Ghanavati and Virechana Karma in the Management of Madhumeha (Diabetes Mellitus), PG Dissertation, Department of Kayachikitsa, IPGT and RA, Gujarat Ayurved University, Jamnagar; 2007. Pandey R. A Comparative Clinical Study of Vamana and Virechana Karma in the Management of Sthula Pramehi W.S.R to Type II Diabetes mellitus. PG Dissertation, Department of Panchakarma, IPGT and RA, Gujarat Ayurved University, Jamnagar; 2010. Shelke S. A Comparative Clinical Study of Vamana and Virechana Karma in the Management of Sthula Pramehi W.S.R to Type II Diabetes Mellitus. PG Dissertation, Department of Panchakarma, IPGT and RA, Gujarat Ayurved University, Jamnagar; 2013. Pakanikar S. A Comprehensive Study of Kuberaksha (Caesalpinia bonducella (L) Fleming) W.S.R to Madhumeha (Diabetes mellitus). PG Dissertation, Department of Dravyaguna, IPGT and RA, Gujarat Ayurved University, Jamnagar; 2004. Tanna S. Pharmaceutical Standardization of Mamajjaka Ghana prepared by two Different Methods (Kwatha and Aqueous Extract) W.S.R to its Antihyperglycaemic Effect. PG Dissertation, Department of Rasa Shastra and Bhaishajya Kalpana, IPGT and RA, Gujarat Ayurved University, Jamnagar; 2010. Sharma R. The Effect of Two Different Dosage Forms of Guduchi, i.e. Satva and Ghana W.S.R Antihyperglycemic Effect on Madhumeha (NIDDM). PG Dissertation, Department of Rasa Shastra and Bhaishajya Kalpana, IPGT and RA, Gujarat Ayurved University, Jamnagar; 2012. Dave D. Clinical Studies in the Management of Madhumeha with Medoghna Rasayana Vati. PG Dissertation, Department of Kayachikitsa, IPGT and RA, Gujarat Ayurved University, Jamnagar; 2006. Khanapurkar SM. A Comparative Study of Efficacy of Triphaladi Vati and Shilajitwadi Vati in Prameha (Diabetes Mellitus), PG Dissertation, Department of Kayachikitsa and Panchakarma, IPGT and RA, Gujarat Ayurved University, Jamnagar; 2008. Gunjal A. A Clinic-Experimental Study on Triphaladi Granules in Apathya Nimitaj Prameha (Type 2 Diabetes mellitus), PG Dissertation, Department of Roga Nidana and Vikruti Vignana, IPGT and RA, Gujarat Ayurved University, Jamnagar; 2013. Sharma CD. Comparative Study of Asanadiyoga Vati and Shilajitwadi Vati in the Management of Madhumeha W.S.R to Diabetes Mellitus. PG Dissertation, Department of Kayachikitsa, Government Akhandananda Ayurveda Collage, Ahmedabad; 2013. Tanna I. A Clinical Study on the Role of Dietetics and Life Style in Aetiopathogenesis of Type 2 Diabetes (Apathya Nimitaj Prameha) and Evaluation of Mahamudagar Vati in Smprapti Vighatana, PG Dissertation, Department of Roga Nidana and Vikruti Vignana, IPGT and RA, Gujarat Ayurved University, Jamnagar; 2010. Patil YK. A Comparative Study of Nyagrodhadi Vati and Gokshuradi Guggulu in the Management of Madhumeha W.S.R. to Diabetes Mellitus. PG Dissertation, Department of Kayachikitsa, Government Akhandananda Ayurveda Collage, Ahmedabad; 2010. Singh KS. Study on Apathyanimittaja Prameha (Type 2 Diabetes) and its Management with Saptarangyadi Ghanvati (A Clinico-Experimental Study). PG Dissertation, Department of Kayachikitsa, IPGT and RA, Gujarat Ayurved University, Jamnagar; 2011. Ghorpade MS. A Comparative Study of Vatsakadi Ghana Vati and Mamajjaka Ghana Vati in the Management of Madhumeha W.S.R to Diabetes Mellitus. PG Dissertation, Department of Kayachikitsa, Government Akhandananda Ayurveda Collage, Ahmedabad; 2011. Alodaria N. Clinical Evaluation of Saptavismshati Gugglu and Haridra Churna in the Management of Type 2 Diabetis Mellitus, PG Dissertation, Department of Roga Nidana and Vikruti Vignana, IPGT and RA, Gujarat Ayurved University, Jamnagar; 2012. Jani J. The Role of Media in Preparation of Vanga Bhasma and Evolution for Hypoglycemic and Anti Hyperglycemic Effect. PG Dissertation, Department of Rasa Shastra and Bhaishajya Kalpana, IPGT and RA, Gujarat Ayurved University, Jamnagar; 2008. Parmar D. The Effect of Puta in the Preparation of Vanga Bhasma W.S.R. to Madhumeha (Diabeties Mellitus). PG Dissertation, Department of Rasa Shastra and Bhaishajya Kalpana, IPGT and RA, Gujarat Ayurved University, Jamnagar; 2008. Tate P. A Pharmaceutical Standardization and Toxicity Study of Naga Bhasma Prepared by Two Different Methods W.S.R to Madhumeha (Diabeties Mellitus), PG Dissertation, Department of Rasa Shastra and Bhaishajya Kalpana, IPGT and RA, Gujarat Ayurved University, Jamnagar; 2008. Walunj M. Role of Media in the Preparation of Laghu Malini Vasanta Rasa. PG Dissertation, Department of Rasa Shastra and Bhaishajya Kalpana, IPGT and RA, Gujarat Ayurved University, Jamnagar; 2013. Khedekar S. Pharmacuetico Pharmaco - Clinical Study of Makardhvaja Prepared by Swarn-Patra Varakha and Bhasma W.S.R to Madhumeha (D.M. ), PG Dissertation, Department of Rasa Shastra and Bhaishajya Kalpana, IPGT and RA, Gujarat Ayurved University, Jamnagar; 2009. Dhundi S. A Study of Shadaguna Balijarita Makaradhwaja Prepared by Ashtasamskarita Parada and its Effect on Madhumeha. PG Dissertation, Department of Rasa Shastra and Bhaishajya Kalpana, IPGT and RA, Gujarat Ayurved University, Jamnagar; 2011. Acharya YT. Charaka Samhita of Agnivesha; Sutra Sthana; Maharoga Adhyay. Reprint ed. Ch. 20. Ver. 20. Varanasi: Chaukhamba Surbharati Prakashan; 2011. p. 115. Acharya YT. Charaka Samhita of Agnivesha; Sutra Sthana; Dhirghjivitiya Adhyay. Reprint ed. Ch. 1. Ver. 123. Varanasi: Chaukhamba Surbharati Prakashan; 2011. p. 22. Sharma R, Amin H, Galib R, Prajapati PK. Astasthana Pariksha - A diagnostic method of Yogaratnakara and its clinical importance. Glob J Res Med Plant Indig Med 2012;1:186-201. Sharma R, Amin H, Shukla VJ, Kartar D, Galib R, Prajapati PK. Quality control evaluation of Guduchi Satva (solid aqueous extract of Tinospora cordifolia (Willd.) Miers): An herbal formulation. Int J Green Pharm 2013;7:258-63. Sharma R, Amin H, R G, Prajapati PK. Seasonal variations in physicochemical profiles of Guduchi Satva (starchy substance from Tinospora cordifolia [Willd.] Miers). J Ayurveda Integr Med 2013;4:193-7. Sharma R, Amin H, Galib, Prajapati PK. Validation of standard manufacturing procedure of Guduci sattva (aqueous extract of Tinospora cordifolia (Willd.) Miers) and its tablets. Anc Sci Life 2013;33:27-34. Sharma R, Harisha CR, Galib R, Patgiri BJ, Prajapati PK. Quantitative estimation of Satva extracted from different stem sizes of Guduchi (Tinospora cordifolia (Willd.) Miers. J Pharm Sci Innov 2012;1:38-40. Acharya YT. Charaka Samhita of Agnivesha; Kalpasthana; Madankalpa. Reprint ed. Ch. 1. Ver. 5. Varanasi: Chaukhamba Surbharati Prakashan; 2011. p. 651. Sharma R, Gokarn G, Amin H, Galib, Prajapati PK. 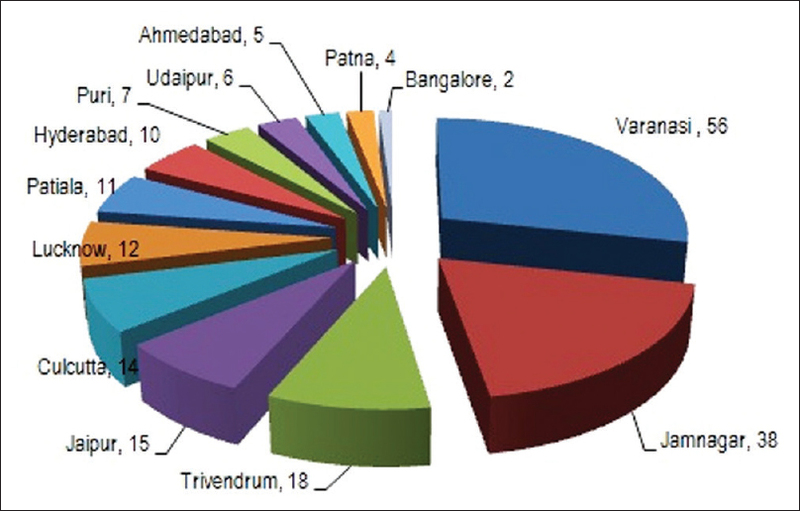 Prevalence of Diabetes Mellitus in Suarashtra region of Gujarat: A survey. Int J Res Ayurveda Pharm 2012;3:169-74. Mokdad AH, Ford ES, Bowman BA, Dietz WH, Vinicor F, Bales VS, et al. Prevalence of obesity, diabetes, and obesity-related health risk factors, 2001. JAMA 2003;289:76-9. Surwit RS, van Tilburg MA, Zucker N, McCaskill CC, Parekh P, Feinglos MN, et al. Stress management improves long-term glycemic control in type 2 diabetes. Diabetes Care 2002;25:30-4. Dhuri KD, Vaidya VA, Vaidya AD, Parikh KM. Stress and Ayurveda: Selye - Mehta dialogue in context of the current findings. J Assoc Physicians India 2000;48:428-31. Dahanukar SA, Kulkarni RA, Rege NN. Pharmacology of medicinal plants and natural products. Indian J Pharmacol 2000;32:81-118. Chopra A, Doiphode VV. Ayurvedic medicine. Core concept, therapeutic principles, and current relevance. Med Clin North Am 2002;86:75-89, vii. Jayasundar R. Ayurveda: A distinctive approach to health and disease. Curr Sci 2010;98:908-14. Banani D, Achintya M, Jayram H. Management of Madhumeha (diabetes mellitus) with current evidence and intervention with Ayurvedic Rasausadhies. Indian J Tradit Knowl 2011;10:624-8. Rajput D, Patgiri BJ, Galib R, Prajapati PK. Anti-diabetic formulations of Naga bhasma (lead calx): A brief review. Anc Sci Life 2013;33:52-9. Chaube A, Nagraja TN, Dixit SK, Agrawal JK, Kumar M, Prakash B. A novel ayurvedic anti diabetic medicine. Anc Sci Life 1995;15:153-5. Lagad CE, Ingole R. Pharmaceutical and clinical evaluation on vanga bhasma in the management of Madhumeha (diabetes mellitus). Ayu 2009;30:443-6. Soni C, Kumar P, Mehta HC, Gaidhani S, Wanjari M. Screening of antidiabetic effect of vanga bhasma (Tin ash) in alloxan-induced hyperglycemic rats. Int J Res Ayurveda Pharm 2011;2:1225-30. Sathe RV, Talwalkar NG, Ajgaonka SS. Investigations in the use of Jasad Bhasma an Ayurvedic preparation of Zinc in treatment of Diabetes Mellitus. Indian J Med Res 1960;48:720-33. Rao VN, Suresh P, Dixit SK, Gode KD. Effect of yashada bhasma in streptozotocin-induced diabetes. Anc Sci Life 1997;17:114-6. Chausmer AB. Zinc, insulin and diabetes. J Am Coll Nutr 1998;17:109-15. Beletate V, El Dib RP, Atallah AN. Zinc supplementation for the prevention of type 2 diabetes mellitus. Cochrane Database Syst Rev 2007;1:CD005525. Jamadagni PS, Jamadagni SB, Singh R, Gaidhani SN, Upadhyay S, Hazra J. Repeated dose oral toxicity of Trivanga Bhasma in Swiss albino mice. Ayu 2013;34:118-23. Rajput D, Patgiri B. Ayurvedic view on heavy metal poisoning with special reference to Naga bhasma (Incinerated Lead) - A literary study. Int J Pharm Biol Arch 2013;4:41-5. Prajapati PK, Sarkar PK, Nayak SV, Joshi RD, Ravishankar B. Safety and toxicity profile of some metallic preparations of ayurveda. Anc Sci Life 2006;25:57-63. Kumar G, Srivastava A, Sharma SK, Gupta YK. Safety evaluation of mercury based Ayurvedic formulation (Sidh Makardhwaj) on brain cerebrum, liver and kidney in rats. Indian J Med Res 2014;139:610-8.